The year 1838 was a momentous one for the violin makers of Turin. In that year, the Chamber of Commerce held its third exposition of the manufactures and arts of craftsmen in that city. Many of the musical instrument makers entered their works. Giovanni Francesco Pressenda, the leading master in the city, submitted two violins and a viola. He received the Silver Medal (no violin maker received a gold medal), and the catalog printed afterwards noted his renown both at home and abroad. Pressenda was not the only violin maker to enter that exposition, for it also marked the ascendancy of Felice Guadagnini as an independent violin maker. Not surprisingly, his half brother, Gaetano II, also entered. Historically, Gaetano had always entered guitars, but this year, because Felice was entering a violin, so did he. Gaetano received a Copper Medal and perhaps took some satisfaction that Felice received just an Honorable Mention. The prospect of a Guadagnini shop rivalry, though, was short-lived: less than a year later, Felice was dead at the age of 28. Another maker was beginning to make his appearance in the city that year: 1838 is the earliest year in which we can identify a Giuseppe Rocca with its original, unaltered label. Notably, this is also the earliest year for which we can identify a Pressenda showing Rocca’s involvement, as there exist several sets of ‘twins’ – two virtually identical instruments, one labeled Rocca and the other Pressenda – from this year. We can say, therefore, that in 1838 there was a wealth of fine violin making being practiced in Turin. It was not an inherently Italian style – its reliance on external forms was derived from the French, as was its manner of craftsmanship – but one has only to look at the paucity of fine craftsmanship elsewhere in the Italian peninsula in those years to realize just how progressive were these makers. The works of Pressenda in particular had a level of refinement and sophistication that justifiably earned him praise from his contemporaries. This 1838 Pressenda violin is quite typical of his best work from this period. 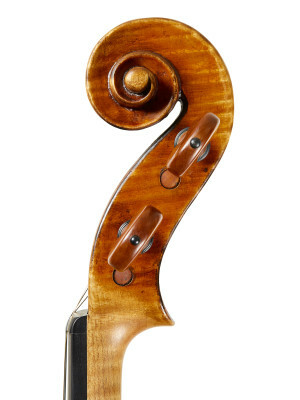 In many respects it is quite close to similar violins by Rocca, but in key details of workmanship – the shape of the f-holes, the finish of the purfling, and the shape and finish of the scroll tail and eyes – it unmistakably shows Pressenda’s hand. Pressenda’s model offers a nod of respect to both Stradivari and Guarneri – a somewhat tapered Stradivari form with smaller Guarneri-like corners, a Stradivari model scroll and an F that seems to mix golden-period Stradivari with late-period Guarneri. In this respect they attain their own distinctive personality, making them quickly recognizable. The pinning of the back is also an acknowledgement of Cremona, but is unnecessary from the standpoint of construction on an external form. Rather, the pins are inserted after the fact, usually close to the purfling and occasionally overlapping it so that the purfling line is bent by the pin’s insertion. Elsewhere, Pressenda followed his own style. On those rare instruments still in original state, he tended to use ivory for the top nuts, saddles and end buttons, a trait probably drawn from the guitar makers who dominated the trade on his arrival in Turin and then imitated by later generations of Turin makers. His saddles are always inset into the bottom block. The purfling is always beech, often with a deep redness that blends into the varnish. His scrolls always have a deep scribe along the center lines, presumably as part of the process of their design and carving, something also picked up on by later makers, and invariably have their chamfers varnished in black. Pressenda’s varnish was much celebrated in his day and was believed to have been learned in Cremona, a notion he never tried to dispel and no doubt actively encouraged. It ranged in color from gold to dark purple but was particularly prized when it was a deep, rich red–orange, oily and thickly applied. It often crackled, sometimes quite extensively, and one usually sees this much repolished by later generations. One of his quirks was to apply it directly to the wood without a sealer. This enhances the contrast in the flame on the maple but results in grain reversal on the spruce, where the softer summer grains absorb so much color that they become as dark as or darker than the winter grains. On this violin this is visible in the flanks but the effect is minimal in this case. The materials, a magnificent single panel of quartered maple for the back and choice strong-grained spruce for the top, are of the first order, and very much what one would expect from Turin’s pre-eminent luthier.